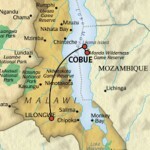 I was in no man’s land for a week after Christmas: the immigration officer at Cobue had abandoned his post and still hadn’t got back a week later when I left Songea House which is situated on the Mozambique shore of Lake Malawi. Perhaps he didn’t think anyone was coming from a snow and ice bound Europe. More likely there was no one to replace him whilst he went on leave. Still, it is the first time I have been in a country for a week but not officially. Songea House which is attached to Nkwichi Lodge is remote. This adjective is over used in travel speak, but a forty-five minute open boat journey to the nearest road of sorts and a further four to five hours’ flight to Lichinga, where there is an airport serviced by Air Mozambique whose call sign is LAM (late and maybe, some say cynically), make it remote in my book. 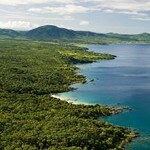 It is certainly easier to get to this vast lake via Malawi itself, but even so some patience is definitely required. 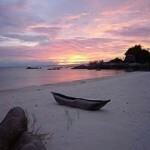 Lake Malawi, the scene of many religious and political skirmishes in the 19th and 20th centuries, is now a haven of peace. But why go all this way? In my view it is the most beautiful beach spot in Africa. Think lower-Zambezi escarpment as a back drop with miombo woodland cascading down to a pristine, powdery sandy beach and Seychelles-type granite rock formations jutting out into the water to form harmonious bays. With no other people at all to disturb your peace you have the perfect chill-out place for a week. We didn’t need any Christmas lights here as the fireflies were out in force. As night fell we were treated to the most amazing spectacle of the bush flickering and sparkling just like one of those fancy chase-sequence lights you can get for the Christmas tree. During the afternoon the lake lived up to its reputation as the lake of stars as the sun’s rays made twinkling shapes on the gentle waves. We left the prettiest swimming pool in the world by boat for the little island of Likoma, our egress point by light aircraft. The Malawian immigration officer looked at our passports, shrugged, smiled and stamped us back into his country, not showing the slightest concern over our week of statelessness. 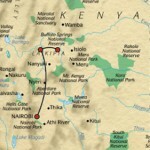 We were then off north to Kenya and the Laikipia plateau for something more active – a thirty-kilometre walk from Sosian ranch to a community-owned camp called Lemartis. I have been sending clients to Sosian for some five years now and I was struck by how professionally Steve and Annabelle Carey run it. Steve, formerly from Zimbabwe and a polymath, was our guide. We followed the course of the Ewaso Narok river which eventually joins the Ewaso Nyiro on its journey into Samburu country. Simple but comfortable mobile camps were set up for us, and we supped under the stars each night. We trekked from Sosian into Ol Donyo Lemboro and then Mpala. 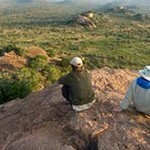 Both ranches together extend to some 90,000 acres of pure wilderness where no other tourists are to be seen. We scrambled up steep kopjes galore, not perhaps as daintily as klipspringers but nonetheless with great eagerness to get to the top and survey the land we had covered and the journey ahead. There were views that unfolded the very face of Africa. We scanned the bush beneath for moving shapes; sometimes what was a grey blur to the naked eye would turn out to be an elephant feeding on acacia mellifera. We found the tracks of at least nine leopard in two days, but sightings of these elusive cats in their favourite boscia tree in these parts remains a rarity. Dik-dik are in great abundance here, although the increasing wild dog population is menacing their numbers somewhat. We got within thirty feet of a kudu. The raptors circling overhead were identified with restrained enthusiasm by Steve – from Pygmy Falcons to Pallid Harriers, Black-shouldered Kite, Dark- and Pale-chanting Goshawks, Tawny, African Fish, Snake and Marshal Eagles and no doubt many more. On our last morning we passed the intersection of the two rivers. We climbed up the bank to try and get a better view of a Grevy zebra (an endangered species) and her newborn foal and were rewarded with a clear view of Mount Kenya in the distance. We then forded the river and arrived at Lemartis. This camp is a triumph of design and has the best flopping areas I have seen in years. That afternoon we were invited to a nearby village and the celebration of a male circumcision. The ceremony is a pre-cursor to a young man’s becoming a warrior and attaining adult male status: those who are circumcised by a nurse with an anaesthetic are often not regarded as true warriors, as they have not undergone the level of pain required to be a brave Moran. The next day with blue, blue skies was the perfect morning for taking off from the bush strip near the camp. The Cessna 206 flew past the mountain again, and of course it was not a problem for the pilot to raise the wing so we could take photographs. Our final approach to Jomo Kenyatta International Airport was a thrill for me at least with our enjoying a rather last-minute, right-hand-down approach. Our little plane’s call sign was clearly known to the control tower, and we made a spectacular swoop over the terminal building, holding up a Kenya Airways 737 and an old TriStar and popping halfway down the runway to make a perfect landing. Two miles behind was another plane on its final more orthodox approach. A few minutes later we had checked in for the flight home. It was perhaps not quite what would be allowed at Heathrow, but then these holidays in Africa offer something infinitely more adventurous and memorable than one can usually enjoy at home. Peter our pilot has eleven thousand hours’ experience and has taken off and landed fifty thousand times, and so one felt completely safe – just as we had with our safari guide and the Laikipia Maasi who had grown up in the bush. Actually, there was no immigration officer at Heathrow either, at least in the queue I chose. A machine let me back into the United Kingdom. One thing I am certain of though: there will be no machines at the immigration hut on the shores of Lake Niassa for a very long time indeed.